A discovery of bold, vibrant and incredible flavors, Colombia’s food scene has long been a bit of a hidden gem. Once overshadowed by the ceviches of Peru and dark wines of Chile, Colombia’s soul food is finally getting the recognition it deserves. Cartagena’s best bites are to be found in only one place: the street. This street food stall investigation uncovers the best bites and sips in Cartagena’s Old City for you. From savory arepas to tart and sweet fruit juices outside of Bolivar Plaza, this mouthwatering guide will share the best, and most authentic, places to enjoy a true taste of Cartagena. You won’t find any food more authentically Colombian than an arepa, or a corn meal cake. Although the standard arepa is delicious, the best are the arepas con queso – warm grilled cakes stuffed and oozing with cheese. These mouthwatering bites can be found on street carts all throughout the cobblestoned old town. You can’t walk twenty feet in the neighborhood of Getsemani (right outside of the walled old city) without bumping into a sizzling street cart grilling an array of chorizo, kebabs, sausages and hot dogs. Served with fried plantains, black beans and rice or just alone, these carts cater to the hungry tourists and late night crowds pouring out of the Café Havana nightclub. Colombians love their sweet treats, and it’s no exception when it comes to their homemade juices. Cartagena’s streets are filled with vendors selling tart and sweet homemade juices, like this tart red juices filled with chunks of fresh fruit. In addition, traditionally clad women set up stalls all around the Old Town complete with blenders and a dozen exotic fruits to whip up any kind of flavor you’d prefer. Thanks to Cartagena’s proximity to the coast, their fresh seafood is abundant, and like Peru and Mexico, locals love to enjoy their catch of the day in a ceviche. Many of the top seafood restaurants, like El Boliche Cebicheria or La Cevicheria serve traditional styles — raw shrimp or snapper in a coconut, lime, lemon and orange bath, as well as more Colombian — mixed with a rich tomato paste, mayo and onion. 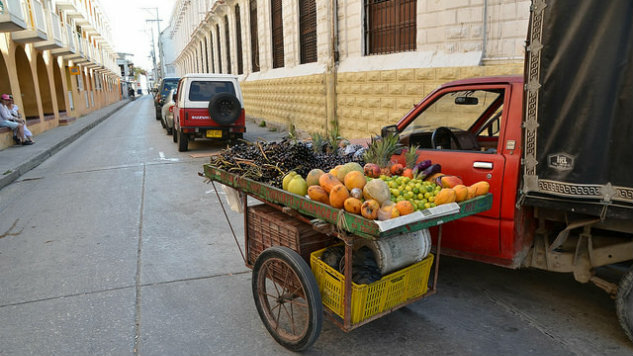 On a hot day wandering through the palm-flanked, pastel-hued streets of Cartagena, there’s nothing that’ll cool you down like a fresh piece of exotic fruit. Although they’re a little kitschy, the palenqueras, or black women dressed in colorful gowns, sell some of the best fruit in town for the lowest prices. Like at any grocery store, touch before you buy to ensure you’re getting the best mango, banana or juicy pineapple. Almost every single meal in Colombia comes with a side of patacones (or tostones) – deep fried or twice baked plantain slices. Unlike other similar snacks you find in the Caribbean and South America, Cartagena’s are seasoned to perfection with smashed garlic and salt and are perfectly crispy on the outside and soft on the inside. Every culture has their version of the stew, and for Cartagena, it’s the Sanchoco – a hearty bowl of Colombian soul food. Made with a mix of fresh fish, plantains, beef, chicken, hen and pork. Although the fork-tender meat is to-die-for, it’s the broth that makes this so mouthwatering — a slow simmered blend of Colombia spices and the fresh ingredients. Grab the city’s best bowl from La Cocina de Pepina. Empanadas are to Cartagena as potato chips are to the United States. Nearly every street vendor in the city sell a variety of these meat, egg and cheese filled cornmeal hand pies. For breakfast, grab a piping, hot from the fryer empanada filled with a runny egg (empanada con heuvo) as you walk through the city’s corridors. Unlike Mexico’s version, the street corn in Colombia doesn’t come loaded with cheese, herbs or spices. Instead it comes as simple as you can get — grilled over an open flame and served in a husk. The corn in Colombia is also a little different — it’s far starchier with larger kernels. It’s a much healthier snack than, say, an empanada — that is, until you order it as the locals do – slathered with butter and cilantro. The staple meal for coffee farmers and blue collar workers, bandeja paisa is the ultimate comfort food in Colombia. Made with a variety of beans, pork, fried plantains, avocado, rice, sausages, polenta and a fried egg. Cartagena’s best is served at the local institution Rancho Paisa and you’ll find a hearty mix of both local workers and hungover tourists noshing on this satisfying plate. Thanks to the sweet tooth populous of Cartagena, you don’t have to wander far to find a South American spin on ice cream and gelato. Even though most of the places prepare a quality treat, the best can be found inside the walled old city at Gelateria Paradiso. The floral wall papered interior paired with vintage, diner-esque chairs make it the ultimate place to sample sweets and relax. Try the coconut and the costeno cherry for the perfect bite. Claire Gallam is a seasoned writer and photographer with a passion for food and travel. She has spent time in more than 40 countries and hundreds of cities. Header photo by Joe Ross CC BY-SA.